South Africa is an adventure seeker's utopia, with a wealth of opportunities to set your pulse racing. Though many holidaymakers use their vacations to simply relax, unwind and indulge in ‘the art of doing nothing’, the excitement of pushing yourself to your limits is often as rejuvenating and as good as, well, a holiday. South Africa may be known for its variety of travel and leisure activities, but the country boasts numerous opportunities for thrilling adventures as well. Let’s start with the epitome of an adrenalin rush – Bloukrans. The Bloukrans Bridge in South Africa’s exquisitely beautiful Garden Route region provides the highest commercial bungee jump in the world. The arched bridge straddles the border between the Eastern Cape and Western Cape provinces. 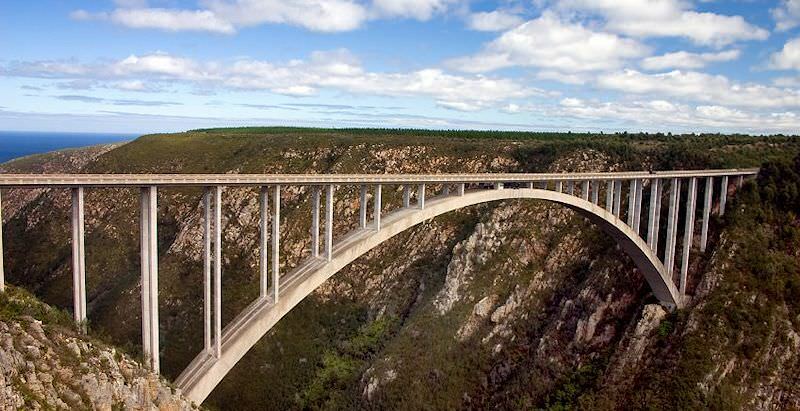 The jump occurs an exhilarating 216m (709ft) above the Bloukrans River. Operating as a commercial bungee site since 1990, the bridge has been the site of numerous world records and hosted noteworthy jumpers like Prince Harry, Thabo Mbeki, Jack Osbourne and Kelly Slater. The Garden Route is typically adventure-rich and ideal for the outdoorsman. A Garden Route tour that includes a Bloukrans jump can be seamlessly combined with activities like deep sea fishing, whale and dolphin watching, elephant encounters and more. Cape Town also hosts extraordinary adventures for thrill fanatics. At 1000m above sea level, Table Mountain provides the highest commercial abseil in the world. The views are incredible, and leaning back into nothing but space so hair-raisingly high above the ground is sure to get the adrenalin pumping! The activity starts with the standard cable car ride to the top of the mountain – a short five-minute trip in a rotating car with 360-degree views. Your starting point is on the Atlantic Seaboard side of the mountain. As a result, your descent is enriched with spectacular views of the city bowl, Lion’s Head, Signal Hill, Chapman’s Peak, the fine beaches of Clifton and Camps Bay and, of course, the never-ending blue sprawl of the Atlantic Ocean. The slope is 112m in length and your abseiling experience is followed by a short hike back to the top. Naturally this activity is quite weather dependent, so if it tickles your fancy be sure to spare more than one day in your travel planning. Paragliding is another awe-inspiring way to experience the city of Cape Town. Though it is not permitted to tandem paraglide from Table Mountain (strictly for experienced solo gliders), many reputable operators offer tandem paragliding from Lion’s Head and Signal Hill. Unlike with the Table Mountain expeditions, as a tandem paragliding passenger you do not require any experience – even children are welcome to participate and share in the thrill. Your departure point, the height you will reach and the duration of your ride is, again, entirely dependent on the weather. If you’re unable to find yourself in the Garden Route or Cape Town during your tour of South Africa, Orlando Towers in the historic township of Soweto near Johannesburg provides a very unique ‘industrial’ bungee experience. Though slightly less than half the height of Bloukrans, you’d be hard-pressed to find a location of equal measure. After serving Johannesburg for over 50 years, the Orlando Power Station was decommissioned in 1998. The station’s cooling towers had become such a landmark that a few bright minds saw the opportunity to convert them for entertainment purposes. Today the handsome mural-covered towers offer a wealth of activities for adventure seekers, from bungee jumping from the suspension bridge to the world’s highest scad (suspended catch air device) freefall – 70m – into the Western Tower itself. Rap jump or abseil down the towers or, for the more experienced, attempt a base jump from the top. Combine an exhilarating endeavor at the towers with a tour of South Africa’s most famous township – you won’t be disappointed. Through films like Jaws and a sensational number of documentaries, great white sharks have captured the imaginations (and fears) of countless audiences the world over. While in South Africa, visitors have the opportunity to meet these animals face-to-face and learn what they’re really about. The shores of the Western Cape provide some of the finest shark cage diving experiences available today. This is undoubtedly one of the most exhilarating wildlife encounters accessible to tourists. The two most popular sites for shark cage diving are False Bay (world-famous for its breaching great whites) and Gansbaai (boasting one of the highest concentrations of great whites in the world). False Bay’s Seal Island is essentially what attracts the sharks and stimulates their extraordinary predation techniques. Though ‘shark season’ in False Bay runs from February to September, the best time to observe natural predation and breaching is between June and August. 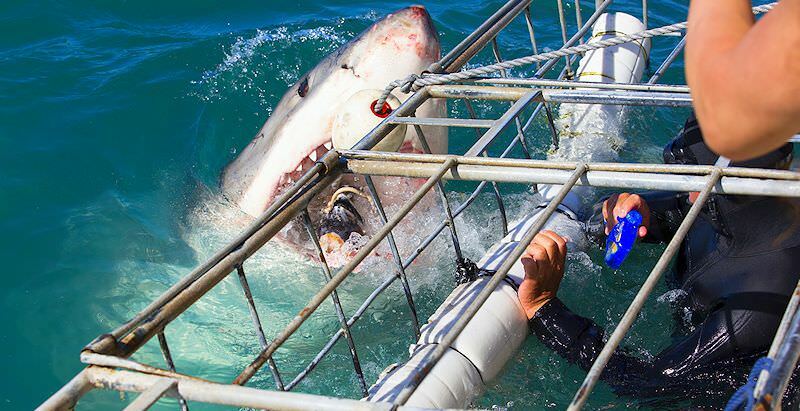 You may not encounter breaching sharks in Gansbaai, but the benefit of booking a trip here is that the local operators run shark cage diving expeditions year-round and, even in the low season (October – January), the success rate for seeing sharks is 95%. Shark cage diving is entirely safe, and there are more than enough reputable operators with spotless safety records to choose from. Expeditions are typically between 3 and 4 hours long, departing around 7am or 1pm. In many cases, you may not even have to enter the water to see the sharks up close, but it is obviously advisable to get your money’s worth! Most operators include the rental of all diving gear (mask, snorkel, weight belt and wetsuits in various sizes) as well as light refreshments on board – all you need to do is show up. If you’re more of a terrestrial being, you may find yourself captivated by South Africa’s collection of caves. The Cango Caves Adventure Tour is not your typical adrenalin rush – in fact, it is quite slow-paced, and children six years and older are permitted to participate. However, children will certainly find the Adventure Tour an easier feat than most adults. The narrowest point of the tour is the Devil’s Postbox. At 27cm high, the only way to get through this tight crevice is to leopard crawl or slide yourself along – depending on whether you want to exit head-first or feet-first. The Devil’s Postbox follows the Devil’s Chimney which, though 18cm wider, continues upward for some 3.5 meters. In other words, it involves a significantly longer period of wriggling and squirming. The Adventure Tour is a 30-minute extension of the hour-long Heritage Tour and is aimed at those excited by the idea of finding themselves in precarious situations. If you are remotely claustrophobic, the Adventure Tour is not for you. Additionally, a bit of extra weight or muscle may be the difference between conquering the caves and getting stuck in the 30cm wide ‘Tunnel of Love’. As is the case with all ‘adrenalin activities’ – know your body and know your limits.